Talib Kweli has been consistently solid ever since he released his manifesto. Even over questionable beats the BK MC almost always delivers. It's the reason why despite liking Mos Def more Talib has always been the half of Black Star whose releases I've looked forward to the most. Coupled with his excellent taste and expertise in running his label Blacksmith, you have an entrepreneur with a very impressive track record. Z-Trip is a legendary DJ with over 20 years of experience and the digging skills to match. You combine the two and you get a project that you don't want to miss, make that project FREE and you get a mixtape that you'd be have to be braindead NOT to download! 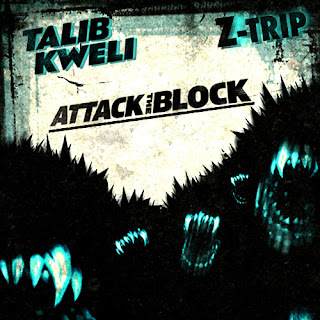 Attack the Block is a mixtape named after a British film about a group of hooligans defending South London from an alien attack. It features a huge list of extremely diverse guest stars including Das Racist, Black Thought, Ab Soul, Killer Mike, Skyzoo, Mac Miller and even Lil Wayne and Mack Maine! It's being offered for free courtesy of the premier mixtape website Datpiff. Enjoy.